Etienne’s 75-yard touchdown rush on the first play of the game set multiple records and gave Clemson the fastest score in ACC Championship history. 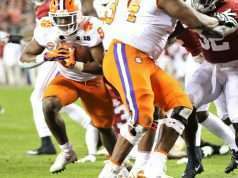 AJ Terrell’s 31-yard interception return near the end of the first half combined with Lawrence’s ten-yard slant strike to Tee Higgins put Clemson up 28-10 to end the half. Travis Etienne has looked like the best player on the field through one half of football, running with his unique combination of strength, speed, and vision. Clemson jumped to a fast start and again heated up to a strong finish at the end of the half. The offense and defense struggled at the same time from the middle of the first to the middle of the second quarter. 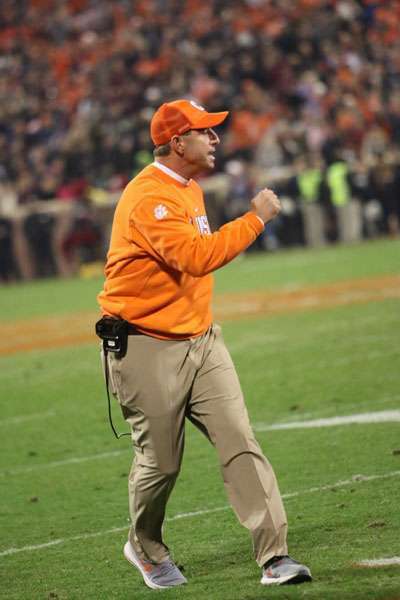 Clemson’s rushing defense allowed three rushes of 20 yards or more and surrendered ten points. 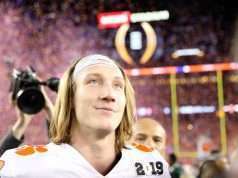 Clemson’s offense didn’t run, Trevor Lawrence struggled to throw, and the Tigers scored zero points during this time period. Clemson’s rushing defense has allowed several chunk plays that has placed Pittsburgh in position to score. Can Clemson’s defense resume their solid rushing defense, or will they allow chunk plays on the ground that will let Pitt back in the game? Since Clemson’s passing attack was hot to end the first half, it will be interesting to see how they attack the defense coming out of the half.